Head NV is a leading global manufacturer and marketer of premium sports equipment. The company, which holds leading positions in all of their product markets, sells sporting goods through over 29,000 accounts including pro shops, specialty sporting goods stores and mass merchants in over 85 countries around the world. Superior technology isn’t limited to HEAD’s sports equipment engineering; it extends throughout all facets of the organization. This is especially true of HEAD’s shipping operations which are responsible for the shipment of products to more than 15,500 accounts in pro shops, specialty sporting goods and mass merchants throughout the globe. As a longtime CMS GlobalSoft customer since 1996, HEAD attributes much of its transportation management success to date to savvy IT, streamlined logistical operations and its usage of CMS WorldLink, which serves as the company’s cornerstone for shipping management. East coast location introduced disparate delivery timeframes between West and East Coast customers. As a result, this warehouse was unable to gain the efficiencies that accrue to the users of the ERP application causing additional process inefficiencies. Failure to meet vendor-specific compliance label requirements is a huge cost drain, resulting in heavy fees per shipment. HEAD adopted the use of this module to mitigate the disparate nature of its delivery timeframes between East and West Coast customers. Ship As Bill As allowed HEAD to ship at one rate while billing at another. In HEAD’s case, the company ships to West Coast customers using three-day delivery services but bill their customers at ground rates. By processing all the Canadian ground packages through CMS WorldLink in Baltimore, HEAD has increased efficiency and tightened inventory control. The company has also accomplished all this while maintaining the same level of customer satisfaction. Using CMS WorldLink’s Custom Label module, HEAD generates two labels via CMS WorldLink as part of its shipping process. 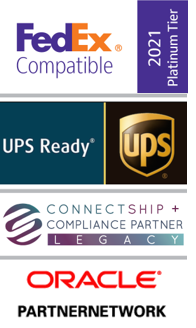 One is the carrier shipping label and the other is the vendor-specific compliance label. This effort has resulted in zero compliance penalties. This module gives your company the ability to ship a package at one service and bill at another. For example, you can send a package via FedEx Overnight, but charge the client at the UPS Ground rate. This module is often used by a manufacturer on a back ordered item. CMS WorldLink further extends the benefits by storing the published and discounted rates for both the shipped and billed methods. ROI: This module gives you the flexibility to ship a package at one rate and bill at another; thus enhancing customer relations. Companies wanting to build custom reports will benefit greatly from our Custom Reports Utility. CMS WorldLink uses Crystal Reports as a standard template writer. The Custom Label utility includes a library of sample compliance labels for various retailers. ROI:Custom Reports gives the user flexibility to present or view historical information to suit business requirements, thus accelerating documentation compliance. This is especially useful when doing carrier negotiations or personnel productivity performance reviews. Moreover, you can create your own custom labels for a variety of uses, including internal purposes or to meet customer specifications.